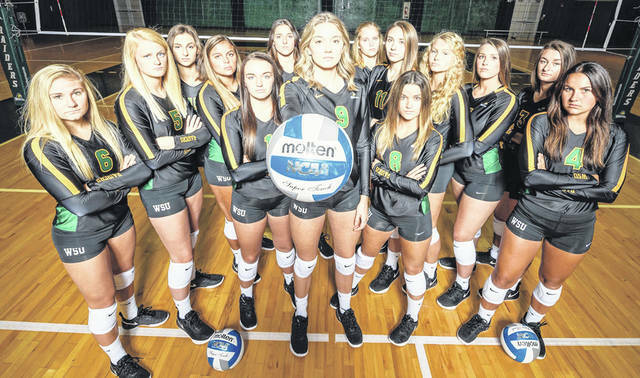 Wright State University volleyball team includes: Jenna Story, Lainey Stephenson, Abby Barcus, Ellee Ruskaup, Taylor Gibson, Mallory Ladd, Natalie Santana, Hannah Colvin, Alannah Lemming, Grace Hauck, Celia Powers, Bailey Wheatley, Teddie Sauer, Veerle Van Oosterom. Head coach is Allie Matters. FAIRBORN — Wright State volleyball is in rebuild mode after going 11-18 in 2017, but the team confidence and enthusiasm emanating from McLin Gym is higher than ever. This will be the debut season for WSU coach Allie Matters, a previous seven-year assistant of a Seton Hall team that had its first NCAA tournament berth in 2014. She made it clear that each player on this year’s Raider squad will have a significant role. In the early phases of practice, Matters can sense the team is more than ready to wake up and do its job on the court. Senior middle blocker Alannah Lemming is also picking up a vibe that suggests the Raiders are in the right mindset at the moment. WSU will have a daunting 12-match road trip, before the Sept. 21 home opener against Milwaukee. Some of the notable non-conference matchups are against two 21-win teams from last year in West Virginia and NC State, and former league foe Valparaiso, a 17-win squad in 2017. “We’re going to be playing around with different lineups. If that means we start Horizon League and we’re not where we want to be, but we’re ready, that’s all I hope for,” Matters said. Though the Raiders only have two juniors and seniors on the roster, Matters feels she has six sophomore standouts that will make that less evident. This experience is most notable for the outside hitter with the third most kills (281) on the team in 2017, Abby Barcus, and middle blocker/right side hitter Teddie Sauer, the second leading WSU blocker (90) last season. Right side hitter Celia Powers should also be noted for appearing in 27 matches as a freshman. Two upperclassmen who will have key roles include Lemming, who was third on the team in kills (170) and second in blocks (97) during the 2016 campaign, and junior defensive specialist/libero Hannah Colvin with the top tally of digs (235) from last season for any returning Raider. Matters says junior outside hitter Taylor Gibson could have a standout year after a productive summer of conditioning. The freshmen class could impact the team with their aptitude for competitive play, Matters believes. Setter Lainey Stephenson and middle blocker Grace Hauck each played for the successful Northern Kentucky Volleyball Club, while defensive specialist/libero Jenna Story has been a member of the talented Union Volleyball Club in Louisville. Being an underestimated team is not a deterrent to Matters, and that seems to be the attitude of the players too. WSU will be back on the court to open the regular season in Morgantown, W. Va. against Connecticut on Aug. 24. For more information on the Wright State Raiders go to www.wsuraiders.com.